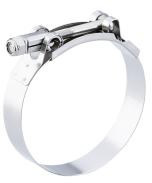 Spring Loaded T-Bolt Clamps are designed to compensate for themal expansion of hose or fitting connections. 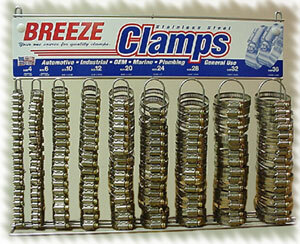 High strength clamping. 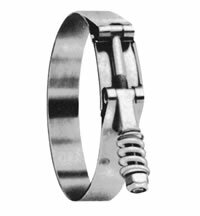 Spring design for constant tension. Full range of sizes available. Used on aplications such as charge air cooling systems. 0175 - 1.75" - 2.06"
0200 - 2.0" - 2.32"
0238 - 2.38" - 2.69"
0250 - 2.5" - 2.81"
0269 - 2.69" - 3.01"
0275 - 2.75" - 3.06"
0288 - 2.88" - 3.19"
0294 - 2.94" - 3.25"
0300 - 3.0" - 3.32"
0325 - 3.25" - 3.56"
0363 - 3.63" - 3.94"
0375 - 3.75" - 4.06"
0388 - 3.88" - 4.19"
0400 - 4.0" - 4.32"
0431 - 4.31" - 4.62"
0444 - 4.44" - 4.75"
0475 - 4.75" - 5.06"
0494 - 4.94" - 5.25"
0525 - 5.25" - 5.56"
0544 - 5.44" - 5.75"
0550 - 5.50" - 5.81"
0575 - 5.75" - 6.06"
0625 - 6.25" - 6.56"
0650 - 6.5" - 6.81"
0700 - 7.0" - 7.32"
0725 - 7.25" - 7.56"
0750 - 7.50" - 7.81"
0175 – 1.75" – 2.06", 0200 – 2.0" – 2.32", 0225 – 2.25''-2.56'', 0238 – 2.38" – 2.69", 0250 – 2.5" – 2.81", 0263 – 2.63''-2.94'', 0269 – 2.69" – 3.01", 0275 – 2.75" – 3.06", 0288 – 2.88" – 3.19", 0294 – 2.94" – 3.25", 0300 – 3.0" – 3.32", 0306 – 3.06''-3.38'', 0313 – 3.13''-3.44'', 0325 – 3.25" – 3.56", 0338 – 3.38''-3.69'', 0356 – 3.56''-3.88'', 0363 – 3.63" – 3.94", 0375 – 3.75" – 4.06", 0388 – 3.88" – 4.19", 0400 – 4.0" – 4.32", 0406 – 4.06''-4.38'', 0413 – 4.13''-4.44'', 0425 – 4.25''-4.56'', 0431 – 4.31" – 4.62", 0444 – 4.44" – 4.75", 0450 – 4.5''-4.81'', 0456 – 4.56''-4.88'', 0475 – 4.75" – 5.06", 0494 – 4.94" – 5.25", 0500 – 5''-5.31'', 0506 – 5.06"-5.37", 0525 – 5.25" – 5.56", 0544 – 5.44" – 5.75", 0550 – 5.50" – 5.81", 0575 – 5.75" – 6.06", 0625 – 6.25" – 6.56", 0650 – 6.5" – 6.81", 0700 – 7.0" – 7.32", 0725 – 7.25" – 7.56", 0750 – 7.50" – 7.81"